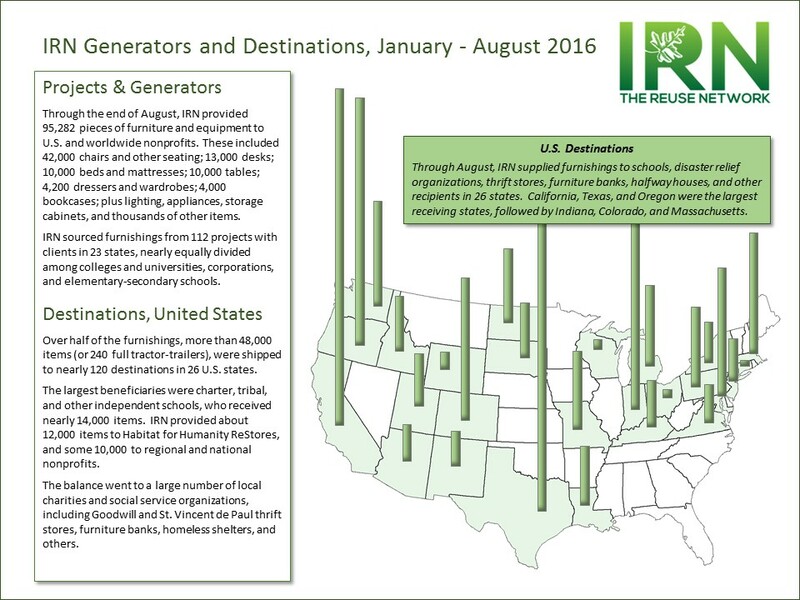 Through the end of August, IRN provided 95,282 pieces of furniture and equipment to U.S. and worldwide nonprofits. These include 42,000 chairs and other seating; 13,000 desks; 10,000 beds and mattresses; 10,000 tables; 4,200 dressers and wardrobes; 4,000 bookcases; plus lighting, appliances, storage cabinets, and thousands of other items. IRN sourced furnishings from 112 projects with clients in 23 states, with a nearly equal division among colleges and universities, corporations, and elementary-secondary schools. Just over half of these inventories were distributed to more than 100 U.S. nonprofits in 27 states, including Habitat for Humanity ReStores, Goodwill and St. Vincent de Paul thrift stores, furniture banks, regional and local aid organizations, halfway houses, charter and tribal schools. The balance were provided to eight international organizations for relief and development projects in 23 countries around the world. Globally and in the U.S., the need for usable furnishings is practically infinite. IRN doesn’t profit when we provide furnishings to charities; they get the furnishings at no cost. We charge the generators to make their surplus furniture go away. We charge less than they’d pay to call in dumpsters, with the assurance that we won’t profit again from their surplus. The generator comes out ahead; IRN makes a living; and disadvantaged children and families get furniture they desperately need. In the end, that’s what’s most important.